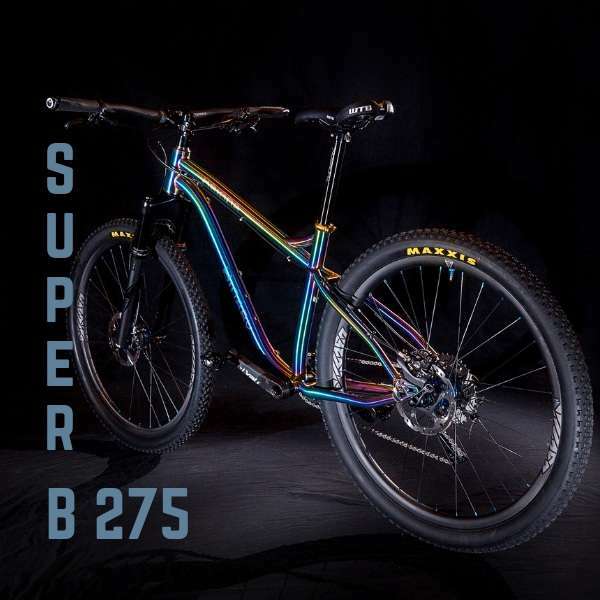 The SuperB 275 is a light, fast cross country race bike executed in titanium. Built with a minimalist design and with weight in mind, the 27.5″ wheel size optimizes acceleration without sacrificing rolling speed. Shorter fork travel and XC geometry maximizes efficiency so every pedal stroke converts to forward motion. The SuperB 275 is a light, fast cross country race bike. It is built with a minimalist design, as well as with material weight in mind. Therefore, the recommended maximum rider weight is 175 lbs. Pedaling efficiency is maximized through the geometry and shorter fork travel. Likewise, the 27.5″ wheel size optimizes acceleration without sacrificing rolling speed. Find out more about the SuperB 275.